I didn’t get out at all on Wednesday, but today I did manage to go for a walk to Swan Lake and make some observations around the house. Weather: The last two days have seen a fair amount of wind and rain. There was a little bit of snow mixed in with the rain this morning. The snow is melting off, but only slowly. I suspect the temperatures are getting too cool at night for it to really melt off fast. There is more snow in the forecast, but at this point I am hoping it’s more a spring snow that doesn’t really stick. There’s enough snow on the ground that the slush will be kind of messy for awhile as it is. Birds: This morning not too long after I got up, I heard crows making a racket in the trees behind the house. I went outside to take a look, and then also heard there were ravens in the mix. There didn’t seem to be any real aggression or anything, just a gathering of corvids. Perhaps they were discussing the days gossip. After a couple of minutes they started dispersing in smaller groups of 4 or 5 crows (though I think the ravens left off as individuals, there weren’t as many of them to start with, however). A little later I heard a call that seemed familiar. It took me a minute to realize that it was a flicker’s ‘clear’ call. Still, it’s been several months since I last heard that call, so I wasn’t quite sure and I decided to go outside and investigate. I was finally able to locate the bird in the top of a tree across from the maintenance building, but couldn’t get a very good look at it. After a minute or two, it flew off in the direction of the main campus. I walked around the house that way and heard it calling again from somewhere down on campus. I was able to re-find it in an Alder behind Whitmore Hall. At that point I was satisfied that it was a flicker and returned home. Around noon, as I was walking down the drive, I noticed a raven flying with sticks in its beak. It flew behind Rasmuson toward Indian River and/or Totem Park. The trees obscured it, so I don’t have a better idea of where it ended up. Ring-necked Ducks are pretty wary birds, in my experience. I’ve found one of the best times to observe them is when there is not much place for them to go. As Swan Lake is still quite covered in ice there is only a small amount of open water near the inflow and outflow. Today I saw three male Ring-necked Ducks at the outflow and decided to try for some pictures. As soon as I climbed up on the snow bank where they could see me, all three swam up to the edge of the ice and got out of the water. I went down to a picnic table there and sat patiently. After several minutes they seemed to relax and two of them started diving for food, though they still stayed at the far side of the opening in a small finger of open water. Finally, after a few more minutes, the third one started to dive, and then they ventured out back toward the main body of the opening. I tried to time my movements to occur while they were all underwater (this didn’t happen very often, usually at least one was on the surface watching me). I was not as successful as I might have liked, and they all immediately swam back for that small finger that was most distant from me. It took several more minutes of sitting in the snow before they finally relaxed again. I could identify each of the birds by their feathers, I think the two less conservative birds were probably first year birds and while they were clearly males, their body feathers did not have quite the sharp, clean gray, white, and black color pattern as the third duck. After the boldest of the ducks had ventured out into the open water nearer to me for a little bit, the other two decided it was okay, but they did not want to stay in the water nearest me. Instead, they quickly swam past me closer to where the water drains out. At this point, I decided I would move on to check out the birds on the penninsula. At the penninusla there was mostly Mallards and gulls. 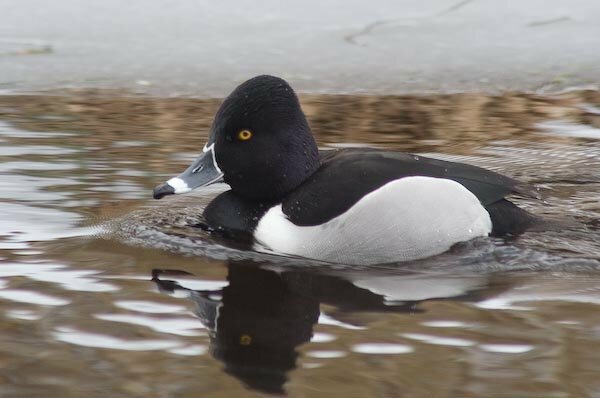 In the opening near the intake, there were a pair off scaups, and a female Ring-necked Duck. There were also some Mallards out on the ice out from the radio station. I spent most of my time studying the gulls that were there. The more I look, the more it seems like there are many gulls that just don’t quite seem to fit into the expected patterns for any particular species. I took pictures of a few such gulls today, and will probably post an entry about them at some point.